Brief Synopsis – A small town is over-run by vicious little creatures who multiply when they get wet. My Take on it – Anyone who knows my taste in movies, knows I’m not a fan of horror and this movie is pretty much as close as I’ll get to that genre. As a kid, I recall seeing this in the theater and really enjoying it. 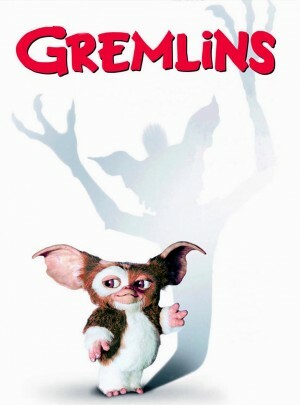 I liked the idea that a cute furry creature like Gizmo can spawn cruel and nasty offspring. This movie obviously isn’t pure horror, but rather what it would be like for Steven Spielberg (one of the producers) to make a horror movie fit for kids along with the whole family. There are many humorous lines and situations, but it isn’t gory and sadistic like many horror movies. The storyline is good and interesting. For 1984, the animatronics and special effects are done quite well. The amount of violence in this movie was one of the instigators of the PG-13 rating (along with Indiana Jones and the Temple of Doom (1984) and Red Dawn (1984) among others) making the MPAA finally realize that they needed an in-between rating. The acting here isn’t really anything to write home about, but I loved how they got Howie Mandel to voice Gizmo. Bottom Line – As horror as I am willing to go. Interesting story and lots of humorous lines. Recommended! God it’s been ages since I last saw this. Great review.